I recently ran into an issue where Outlook 2016 would randomly crash either at startup or during normal operations. In my case, during the crash I could hover my mouse over the taskbar icon and see there was a hidden popup box asking for Windows Credentials, but I couldn’t get the box to appear. While looking in the Event Viewer logs, I would see the faulting module was Windows.UI.Xaml.dll. If I browsed to the Control Panel, there’s usually an icon for Mail (32-bit), and in my case, it had a generic paper icon and wouldn’t open. 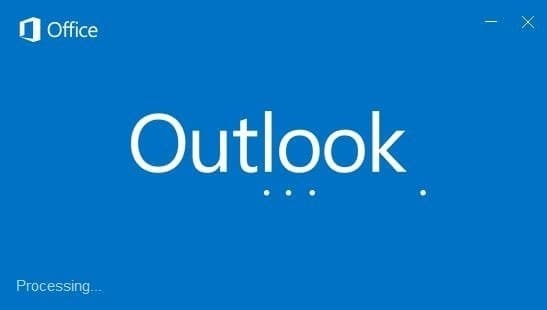 The following fixes could also work if your Microsoft Outlook hangs at Processing or Starting. The most extreme fix is to completely uninstall Microsoft Office and reinstall it. The best option is to use the Microsoft Uninstall Tool, click on the Download button under Option 2 for the Easy Fix Tool. It’ll download a .cab file that you can run on your machine. I suggest running it and rebooting, then run it one or two more times with restarts to ensure everything is completely removed. Once Office is completely removed, you can reinstall Microsoft Office from scratch and setup your Outlook accounts again. You can try running Outlook /safe from a run prompt (Windows Key + R). If Microsoft Outlook works correctly in Safe Mode, then you’ll want to check your COM Add-Ins by going to File > Options > Add-Ins. Browse through your add-ins and try disabling them. A few that have been known to cause issues are WebEx Productivity Tools, Outlook Social Connector 2016, and Adobe Send & Track.